One of the most common medical procedure is surgery. 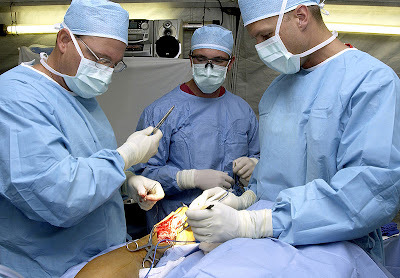 All forms of surgery are considered invasive procedures. There are "noninvasive surgery" which usually refers to an excision that does not penetrate the structure being excised such as Lasik surgery or a radiosurgical procedure (irradiation of a tumor). A study published on BMJ-British Medical Journal finds that surgeons aged between 35 and 50 years provide the safest care compared with their younger or older colleagues. A thyroidectomy is a surgical operation that involves removing all or part of the thyroid gland. A thyroidectomy is performed when a patient is diagnosed with thyroid cancer or some other condition of the thyroid gland (such as hyperthyroidism). One of the complications of "thyroidectomy" is voice change and patients are strongly advised to only be operated on by surgeons who protect the voice by using electronic nerve monitoring. Most thyroidectomies are now performed by minimally invasive surgery using a cut in the neck of no more than 2.5 cms(1 inch).